Just as the official Chinese manufacturing PMI's disappointing Thursday print (to a three year low) pressured stocks on the last day of February, and sent both the MSCI World Index and the Dow Jones to three consecutive days of declines, the longest such stretch of 2019 yet, overnight's Caixin PMI which unexpectedly posted a sharp rebound in February, rising to 49.9 from 48.3 in January, offered some reassurance to investors concerned about the growth outlook that the global economic drop may have troughed while "optimism" for a trade deal returned; Treasuries extended their recent decline and the dollar pushed higher for a third day before easing back. The result is a sea of green in global stocks with the S&P trading back over the critical 2,800 level. Bullish sentiment stormed back led by China, where shares outperformed with the Shanghai Composite closing 1.8% higher following confirmation that MSCI Inc. will quadruple the weight of Chinese stocks in its global benchmarks from 5% to 20%, while in contrast to the small decline in NBS manufacturing PMI reported just one day earlier, the Caixin manufacturing PMI bounced back in February from the dip in January. It rose by 1.6pp to 49.9, although January-February combined, Caixin manufacturing PMI averaged at 49.1, lower than 49.7 in December last year. Most sub-indexes of the survey rebounded in February vs January. The fact that the index remained just barely in contraction territory was offset by a sharp increase in the forward-looking new orders index component. 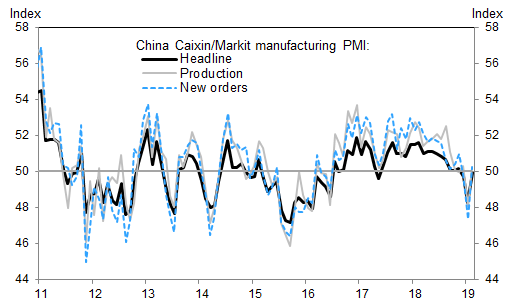 According to Goldman, the Caixin manufacturing PMI showed "some early signs of better growth momentum in the manufacturing sector in February. However, the floating holiday and continued weakness shown in other indicators such as NBS manufacturing PMI added uncertainties to the above view, and for the period of January to February on average, growth momentum still likely softened from late last year. We continue to expect more policy easing to support the economy, and Jan-Feb industrial production data to be released in two weeks' time will shed more light on the underlying growth trend early this year." As a result, China’s blue-chip CSI300 index surged 2.2% to land its best week since November 2015 after the MSCI announcement. It could potentially draw up to $80 billion of fresh foreign inflows to the world’s second-biggest economy. Elsewhere in Asia, Australia's ASX 200 (+0.4%) extended on opening gains as IT and healthcare names led the advances, whilst heavy-exporter Nikkei 225 (+1.0%) outperformed after the yen dropped to a 10-week low against the greenback. Later in the session, European shares opened notably higher, with the Stoxx Europe 600 Index rising to the highest in almost five months, as 18 of 19 industry sectors were in the green and carmakers leading the charge, even after PMI data showed that euro-area manufacturing contracted last month, offset by the fastest rise in German retail sales since Oct 2016. 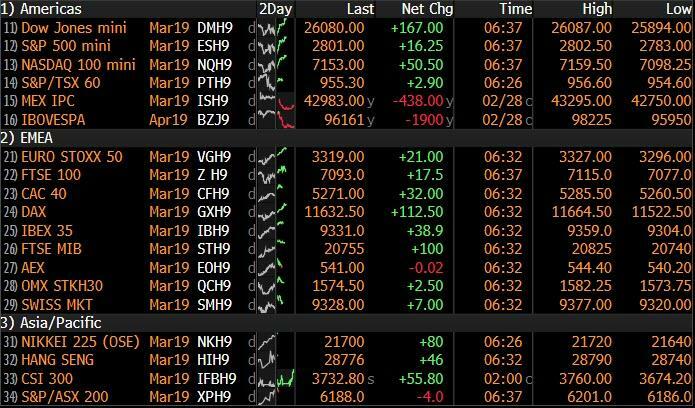 “We are seeing a fairly decent uptick in European markets,” said CMC Markets analyst David Madden, citing the combination of U.S. and China data as well as encouraging comments from the United States on China trade talks. To be sure, the bad data in Europe continued and Spain’s manufacturing sector contracted for the first time for more than five years in February data from Madrid showed while in eastern Europe Czech manufacturing sentiment fell at its fastest rate in six years. 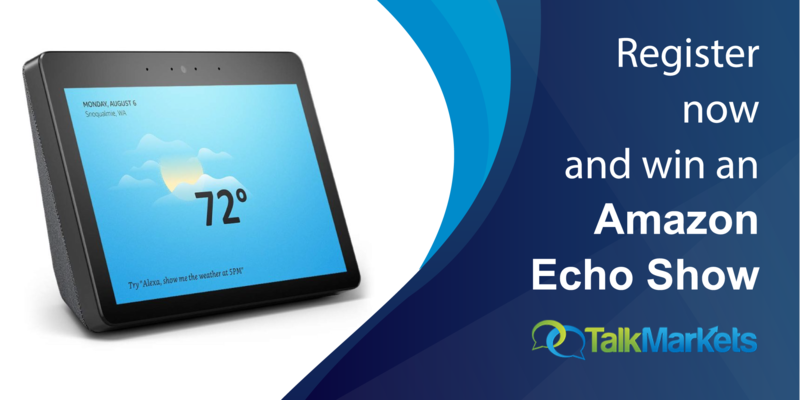 However, market reaction showed that “bad news can be good news” because it could well encourage the European Central Bank to hand out cheap TLTRO loans to eurozone banks in the coming months. 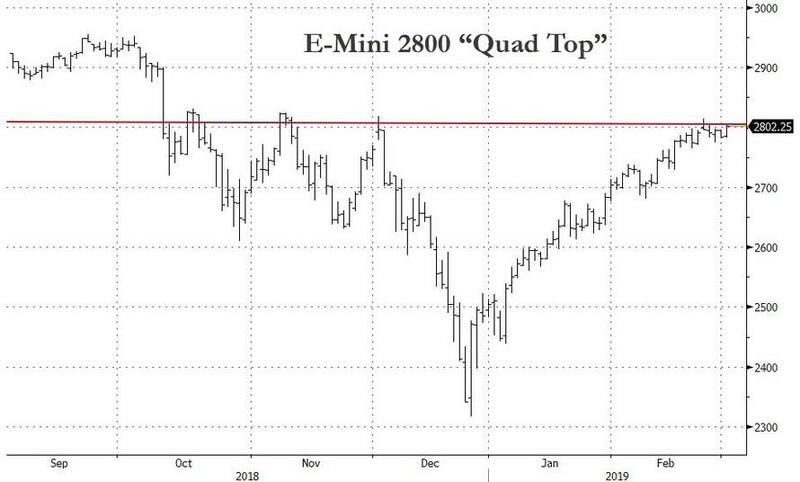 Boosted by strong Chinese data and weak European data, futures on the S&P 500, Dow Jones and Nasdaq gained, with the EMini back over the critical 2,800 "quad top" resistance level. Emerging-market stocks snapped a three-day losing streak. Traders will be relieved to see a strong close to the week after a 16% surge from Christmas through the start of this week, MSCI’s gauge of global equities has tread water as investors await progress in U.S.-China trade negotiations. American officials are preparing a final deal that Donald Trump and China President Xi Jinping could sign in weeks, even as the debate continues in Washington over whether to push Beijing for more concessions. Meanwhile, as Bloomberg notes, geopolitical concerns remain in the background, amid tensions between India and Pakistan and the failure of a summit between Kim Jong Un and Trump to achieve an agreement between the U.S. and North Korea on denuclearization. Mixed messages on trade combined with the collapse of the summit between Trump and North Korean leader Kim Jong Un on denuclearization, and data from China showing slowing factory activity to pressure U.S. stocks as Reuters notes. “News that President Trump walked out of the meeting with Supreme Leader Kim because the two sides couldn’t reach an agreement over North Korea’s nuclear disarmament, dashed hopes for an easing in geopolitical tensions,” analysts at ANZ said in a morning note. Overnight, president Trump said he believes a good deal with North Korea will happen and added that North Korea did not want to fully denuclearise. Meanwhile, North Korea Foreign Minister said if US lifts sanctions, North Korea will denuclearise, whilst adding that Pyongyang will not change its stance even if the US seeks further talks. US Secretary of State Pompeo said that North Korea basically asked for all sanctions to be lifted. In the latest Brexit news, UK's Labour Party is reportedly moving towards a compromise plan which would allow PM May’s Brexit deal to pass but makes it clear that Parliament “withholds support” until the deal has been put to a public vote; according to multiple party sources. Following a stronger than expected Q4 GDP print, Dallas Federal Reserve Bank President Robert Kaplan said on Thursday that it will take time to see how much the U.S. economy is slowing, supporting views of the Fed’s rate-hike holiday at least through to June. In rates, long-dated government bond yields in Germany, the euro zone’s benchmark issuer, were set on Friday for their biggest weekly increase in more than a year, reflecting easing concern about the global growth outlook and hopes that a no-deal Brexit will be avoided, and ignoring today's equity euphoria. 10Y TSY yields meanwhile continued to rise and were trading at 2.73% today after trading 10bps lower earlier in the week.